MPower Labs on Nov. 11 launched GoalMine to the public after several months in private Beta. GoalMine is an online savings and investment tool which allows users to buy, use or give gift cards towards savings goals. The gift card can be easily invested into stock mutual funds, bond mutual funds, or FDIC-insured savings accounts, without the high minimum balances that most mutual funds require. GoalMine accounts can be opened with as little as $25 and have relatively low fees compared to many investment options. The company aims to make saving towards goals simple and fun. GoalMine employs familiar methods, such as gift cards and social media, to find prospective customers and to help those customers reach out to their family and friends who may help them reach their savings goals. Users can share their goals via Facebook or Twitter, and add photos from Flickr or Picasa, and link YouTube video to share their progress or goals. The platform can also be used for fundraising. It takes just a few minutes to establish a GoalMine account. Users must provide their name, address, and Social Security Number, and be U.S. citizens over 18 years old. I was able to establish four accounts with different savings goals, timelines and investments in seven minutes. The account has an easy wizard, which helps in deciding which account is best, and further offers help in calculating the savings goal, including statistics about what the goal may cost. It also prompts you to set your goal either by when you want to achieve it or how much you can save per month. the wizards are easy to skip if you prefer not to use them. Unlike other saving programs, I wasn’t required to make an initial deposit at time of opening, nor did I have to establish a monthly automatic funds transfer. I established a college savings goal, and then “liked” it on Facebook, where it posted to my wall so that others could visit the goal. From there, others have an opportunity to purchase GoalPacks towards that goal. There is a fulfillment fee for the GoalPacks of $2.95 each for less than $100 or $3.95 per $100 for larger amounts. The online withdrawal process is simple and costs $1 each time. Electronic transfers to a bank account are made the same day. Check withdrawals take a little longer, arriving in seven to ten days. 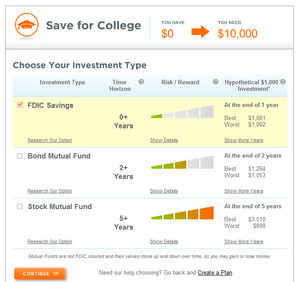 Savings: The savings account are offered through The Bancorp Bank of Wilmington, DE and are FDIC-insured to $250,000. Currently the account earns 0.30% APY.